There are numerous applications of heaters at industrial and commercial sites. Whether it’s an open coil duct heater, a tubular or a finned tubular duct heater, each duct heater serves the main purpose which remains the same. However, the type may vary based on their construction, working, advantages, disadvantages and functionality differences. The types of heaters used though can vary from person to person and industry to industry. While there are a wide variety of heaters available in the market, some seem to standout more than others. Duct Heaters in general and Tubular Duct Heaters in particular fall in that category. They are heaters designed for a variety of applications that include but are not limited to space heating, etc. These heaters are one of the widely-in-demand heaters of the market, and not one but several industries make use of them on a daily basis. Duct heaters can be broadly categorized into two categories, air duct heaters and process heaters. While both of these categories are variations of the same model, their uses are considerably different. Air duct heaters are used for heating of the ventilation systems in industries and to provide comfort to other heating applications while they are in play. Process duct heaters on the other hand are used for operations that involve industrial process heating such as ovens etc. They specialize in handling situations that require forced circulation or recirculation of heat. What are Finned Tubular Duct Heaters? One of the leading uses of tubular duct heaters is to process air in industrial heating applications and to temper forced air in a number of industrial processes. The heater can come in a number of different wattages. This will largely dependent on the outlet of air temperature and the velocity of the air coming through inside the duct heaters. The tubular heating elements that are used in duct heaters are important in a number of ways, primarily in terms of its strength. These heating elements are toughened up and designed to provide protection against corrosive air environments and even provide effective resistance to vibration in comparison to other heating elements of duct heaters such as open coil ones. The applications of duct heater differ from industry to industry. The fact that tubular heaters can be modified to fit the needs of the industry and the application at that particular time plays an important role in it. The following is a list of some of the many uses of tubular duct heaters in industries. Most of these uses are in line with the modern technological requirements and specifications. Most duct heaters are designed in a similar way to one another. Yet their designs can have variations as per their heating elements and in relation to the industry they are to be used in and the application that they will be expected to fulfill. Here is a lowdown on some of features that a typical tubular duct heater is made up of. It should be remember that each design of tubular duct heater can be varied as per the demands of the customer in line with the application and industrial operation requirements. The fact that there are a large number of heaters available in the market means that companies are striving to provide service to the customers that they need. A competitive heater market also highlights the need for heaters to be unique and advantageous for industrial applications to be made use of regularly. This is why tubular duct heaters stand head and shoulder above other heaters in the heater market. There are tons of different heaters available in the market and yet, tubular duct heaters with their distinct, modifiable design have continued to be used heavily in a number of industries. Why should you buy a tubular duct heater? A whole host of advantages and benefits of using these heaters for your applications are outlined below. One of the benefits of using tubular heating elements is that they are Versatile. Being versatile means that they are able to adapt to different situations and can be used for multiple applications without having to make significant changes. One advantage that these heaters have over other duct heater is that the use of tubular heating element that is rigid makes it resistant to Corrosion and oxidation. Made from stainless steel casings these heaters are less prone to faults and in the event of a fault they are widely used which makes their maintenance easy and quick. Not only are the heaters easy to maintain, they come with an instruction manual and are often easy to install. Being resistant to corrosion and oxidation and its creation from strengthened steel makes these heaters one of the most durable ones in the market. The makers of the heaters realize that power supplies can vary from area to area, that is why they are made Compatible with local power supplies in attempt to increase their global and intra state appeal. Heaters are usually used in dangerous situations where the chances of a mishap are higher, these heaters are built for safety, ensuring that all standards of safety are met. Price Comparisons –While at one time open coil heaters were considerably less expensive than finned tubular, the gap has narrowed and, in some cases reversed. The finned tubular construction is often less expensive for large face area coils as the mechanical support mechanism for finned tubular elements is much simpler than for open coils. Most of the cost of a typical blast coil heater is in the controls, not the elements. Wet Locations –Where excessive moisture is likely to be present in the airstream, the finned tubular construction is invariably preferred. Unglazed ceramic bushings which support open coil elements will absorb moisture, particularly when the heater is not energized. Upon startup, the coils may short through the wet bushings to the ground. When air carries droplets of water (ie. Downstream from a spray type humidifier or immediately downstream from a cooling coil), stainless steel finned tubular elements should be specified. Protection Against Foreign Matter-Heaters stored at the job site are likely to accumulate dirt and dust. If the heater is not properly vacuumed before startup, the dirt can form a path to ground in an open coil heater, but will simply smoke off of a finned tubular element. Other foreign matter such as lint and insulation backing can cause an open coil to short to ground. Serviceability – Wattco finned tubular elements can be replaced from the terminal box in the unlikely event of element failure. Each element is mounted into the box with its own individual mounting flange. Open coil elements are more difficult, and in some cases, virtually impossible to replace in the field. If the heater cannot be conveniently removed from its mounting, the finned tubular construction should be used. Over temperature Protection – Each finned tubular blast coil heater can be furnished with a linear thermal cutout having a small diameter, extra sensitive capillaries that will shut down the heater if any size-inch increment overheats. The entire face area is then protected. 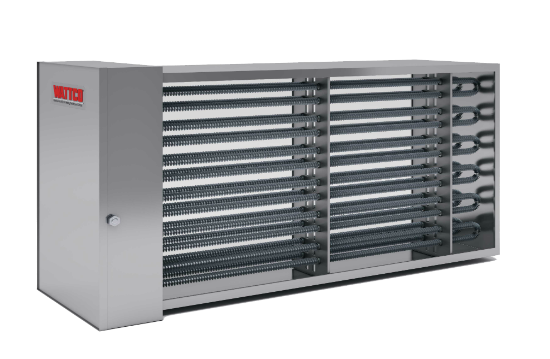 Open coil heaters typically use disk-type thermal cutouts located near the terminal box and the thermal cutout systems on finned tubular heaters give protection even when the airflow is not uniform. Linear limit cutouts are fail safe – the heater will automatically shut sown if the cut out loses its fill. (Linear limit thermal cutouts are also available on open coil heater but must be specified). Mechanism Stability – Finned tubular heaters are fundamentally more rugged than open coils, They are built to withstand more mechanical abuse. If there is a significant vibration in the system, the finned tubular construction is preferred. In fact, finned tubular blast coils have become the standard for nuclear power plant applications, where heaters must undergo stringent vibration and seismic testing as a part of the approval process. Airflow Uniformity-If the airflow pattern over the face of the heater is not uniform, hot spots can develop in pockets of low airflow. This can cause severe overheating and burnout more readily in open coils since the supporting brackets create a box-like blockage effect. Conversely, hot spots tend to dissipate by conduction along the sheath of a finned tubular element. Pressure Drop – The pressure drop across a finned tubular coil is greater than across an open coil. However, if pressure plates must be added to an open coil to prevent hot spot burnouts, the pressure drop over the open coil far exceeds the drop over a finned tubular heater. Controllability – While finned tubular elements are more massive, actual laboratory tests show that outlet air temperatures are controlled more precisely when the finned tubular construction is used. Finned tubular elements reduce the rate at which controlled components cycle because of their greater thermal inertia. This factor alone increases the life of such components as magnetic contactors and step controllers. If solid state SCR controllers are used, precise temperatures are held with either open coil or finned tubular elements. All frames are made of heavy gauge corrosion resistant steel. Stainless steel frames are also available upon request. If you want to increase the efficiency and functionality of your business with the perfect custom build duct heating solution for your industry, contact us at the given details below and make sure you have the duct heater your industry needs.